The musicians in Trinidad’s Casa de la Trova (music club) look old enough to have been playing before the 1959 Cuban revolution. Deeply lined faces speak of many a long night in smoke-filled bars and bodies seem to creak a little when they move around the stage. But there’s clearly no slowing down in the ability to play or sing. It might not be the approved recipe for a long life but it seems that decades of music, rum and cigars haven’t done these guys much harm. Maybe the relatively simple Cuban diet and the fact that most people walk wherever they want to go in Trinidad has offset the evils of spirits and tobacco. We’ve been lured into the Casa de la Trova around midday but the barman is already flat out making mojitos with help from the waitress who adeptly works her way down the line-up of glasses on the bar, adding the final touch of a stem of mint. A couple has taken to the dance floor – the woman in a skin-tight black dress and her partner in black trousers and white lace shirt open almost to the waist. Actually I’m not sure if he is a man, if you know what I mean. He – or she – is a fantastic dancer and I don’t really care what his orientation is but he’s certainly intriguing, with his eye make-up, fine-boned face and lithe limbs. They undulate through a sultry salsa while the double bassist, trumpeter, the men on the maracas and the guitars and the lead singer play on – no doubt they’ve seen just about everything over the years. The Casa de la Trova is in the old cobblestoned centre of Trinidad. 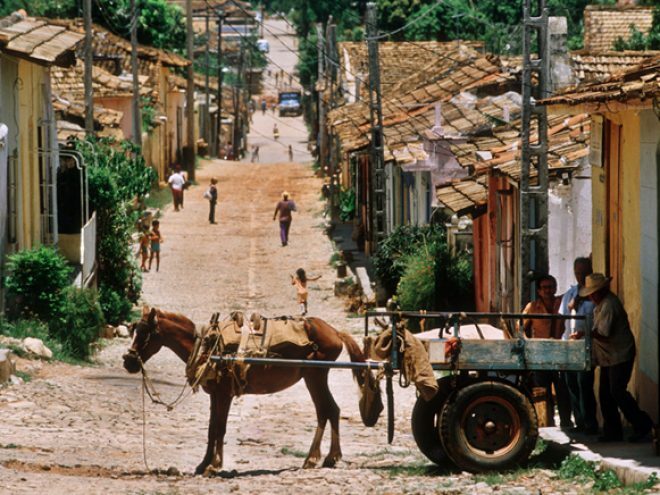 There is no motorised transport in here – there’s a man on a donkey (who with entrepreneurial flair has had a sign attached to the donkey’s ears advertising photo opportunities for a few Cuban convertible pesos), and the odd bicycle. The old town, which was first established in 1514 by Diego Velasquez, is a UNESCO listed site. Thanks to its relative isolation from Havana, and the economic decline that set in after its booming sugar industry collapsed in the mid 19th century it has been left as a near perfect time capsule of the past. There are historic buildings to visit here but on a humid afternoon and post cocktail I was just happy to wander. So too was the seller of handwoven baskets who followed me persistently until finally convincing me that the very thing I needed was a shopping basket, and for good measure a sunhat. I bought both, perhaps influenced by a brief look inside one of Cuba’s still functioning ration stores. In order to ensure that poorer citizens get their fair share of essential groceries such as sugar and soap, which can be in short supply, ration cards are issued. These are used in special shops, which look rather like old fashioned grocery stores with everything stacked up behind the counter; the difference being that the shelves are only sparsely populated with goods, and what is there is is extremely basic. But the shoppers we met inside were cheerful, happy to show us how their ration cards worked and told us they were happy we’d come to Cuba. Purely by chance, we stumbled into the courtyard of the Casa de Aldeman Ortiz, a classic 19th century mansion, and discovered a tiny café serving up excellent coffee in hand-thrown pots. From here we could hear the strains of musicians who had set up along one of the neighbouring streets, busking expertly to the few tourists in town. Trinidad is not just a pretty face – about 10km south is Peninsula Ancon – regarded as the best beach on Cuba’s southern coastline. For reasons that were never properly explained (Cuban tourism works a little like this – the best coping mechanism is drink another mojito and go with the flow) we’d been shifted from a heritage hotel in town to the beach. Although sad to miss staying in a historic property the lure of a stretch of Caribbean white sand beach and much promoted turquoise sea didn’t seem too bad a trade off. And the hotel lobby seemed quite upmarket – open on both sides to catch the sea breezes, tropical prints on the cane lounge suites and even a welcome committee of two dancers in bikini tops and g strings who transfixed almost all the new arrivals as they gyrated around the seats. I was a little taken aback when I was handed a pile of plastic bracelets after I’d got all the rooms organised. “Thanks, but Kiwis really don’t go for these,” I said to the receptionist. “Oh but you have to wear them here,” he replied.